MTLL Night at Jimmy John's Field! Updated Friday February 8, 2019 by MTLL. 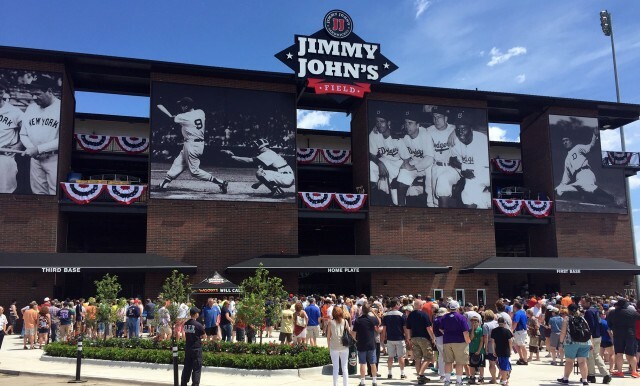 Join our 3rd Annual Jimmy Johns Stadium night! This event has been a huge success. We have had over 600 Little League families at the ballpark each year. Each ticket includes a pop or beer. There will be numerous activities for the kids. All players will be on the field for the National Anthem. Some will hold the flag in the outfield and others will line the base paths. Autographs are easy to get and the players are very accessible. Fireworks will follow the game. To purchase your tickets click on the link below and enter the code. This is a great event to attend and highly recommended. A cheap way to enjoy a night out with the kids with free parking. Every Ticket Includes a FREE 12oz Soft Drink or Beer! Please Order Tickets now or at your earliest convenience so we can finalize our plans for our special Day!